Luscious, lemon-scented, cornflower blue flowers with ruffled petals in May and June and sword-shaped, grey-green leaves, retained all year. 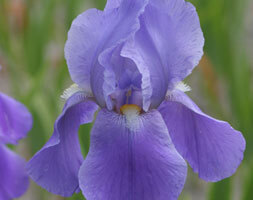 This stately bearded iris looks lovely towards the front of a sunny, well- drained border among lavender or Russian sage. A popular, tall variety, it will need staking.